Last week I was strolling through the local farmer’s market and it was so obvious that it was tomato season. Every stand had beautiful ones that were perfectly ripe. On a whim, I asked one of the vendors if they had any bulk discounts. They said they could give me 25 pounds of tomatoes for $25! That’s a ridiculous price. So I lugged a huge box of tomatoes back to my car and only later tried to figure out what to do with them. I settled on salsa and decided to try to can some. Salsa is slightly trickier to can than something like pickles because you have to get the acid levels right or you could run the risk of botulism contamination. Usually this means adding vinegar or citrus juice to the salsa. It was the first time I’ve ever tried to can salsa and I think it turned out okay. Not great, but okay. It’s a little more watery than I would’ve liked, but I can just drain it a bit and it should be okay. Regardless, I always have fun canning things and it was a reminder to me of how fun it is to preserve the freshest of the season. I’m not going to post on the salsa process just because I’m not sure that I feel comfortable enough with it to write about it. I was sort of winging it at times. But, if you have a free morning, this is the time of year to explore canning. Everything is ripe and beautiful. If you’re interested in getting started, I highly recommend reading the Ball Jar website which is a great general resource and my friend, Marisa’s, wonderful blog Food In Jars. She is an amazing blogger and has tons of resources on how to get started and recipes. I probably have 25 pounds of tomatoes from my garden on my counter right now. I’m surprised $1/lb for a big bulk order is an outstanding price, they regularly go for low $1’s per pound in the grocery store for local produce (non-organic). But I know, different cities and states are different prices! 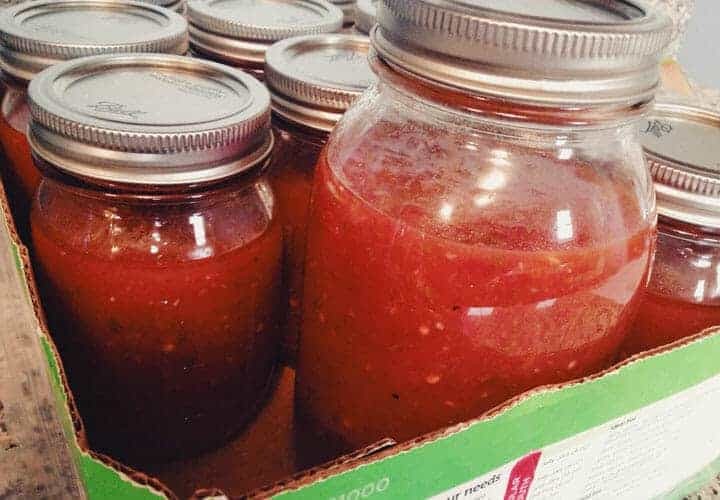 You ever think about just throwing tons and tons of tomatoes into a strong blender for several minutes to pulverize the seeds and pulp while keeping the vitamins and fiber…and then canning all that beyond-easy-to-make tomato sauce? Might as well throw it on the stove and reduce it down before you can, since you have to heat it up to preserve it anyway! I haven’t tried that but I don’t see why it wouldn’t work. I think you’d still have to add some acid to it if you wanted to can it though. I am just waiting for our tunnel house to start pouring out the tomatoes! Last Summer we hauled out 10kg every couple of days for a few weeks, it was great!! I canned up enough canned tomatoes to last us all year – just down to the last few jars this week.